There is an unusual relationship in Jiu-Jitsu where the more skilled the practitioner becomes, the less energy they use. That new white belt may run 20 miles a day and lift twice their body weight, but they will inevitably gas more quickly than the seasoned brown belt simply because of how efficient a brown belt is when passing guard. Still, when that seasoned brown belt also learns how to build bull-strength through extra conditioning, they become all the more formidable. Extra measures must be taken by combative athletes to build or maintain strength, speed, and cardio for a competitive edge. The athlete that has a more powerful body is able to stay on the mat for longer and move more aggressively to control pacing. Athleticism is an advantage, especially against someone who does very little off-the-mat conditioning. You can also build strength at a more measured rate than you can develop Jiu-Jitsu skill because conditioning is much less of a cognitive process. The purpose of this blog is to provide some guidance for eager Jiu-Jitsu practitioners who wish to improve their performance through extra conditioning. Any questions regarding specific exercises should be directed towards a fitness professional. To start, here are five exercises that combative athletes should be doing to improve their game. Swings can build strength in the hamstrings and glutes and can give explosive power in the hips, says Josh Macri, Strength and Conditioning Specialist at Train For Life. 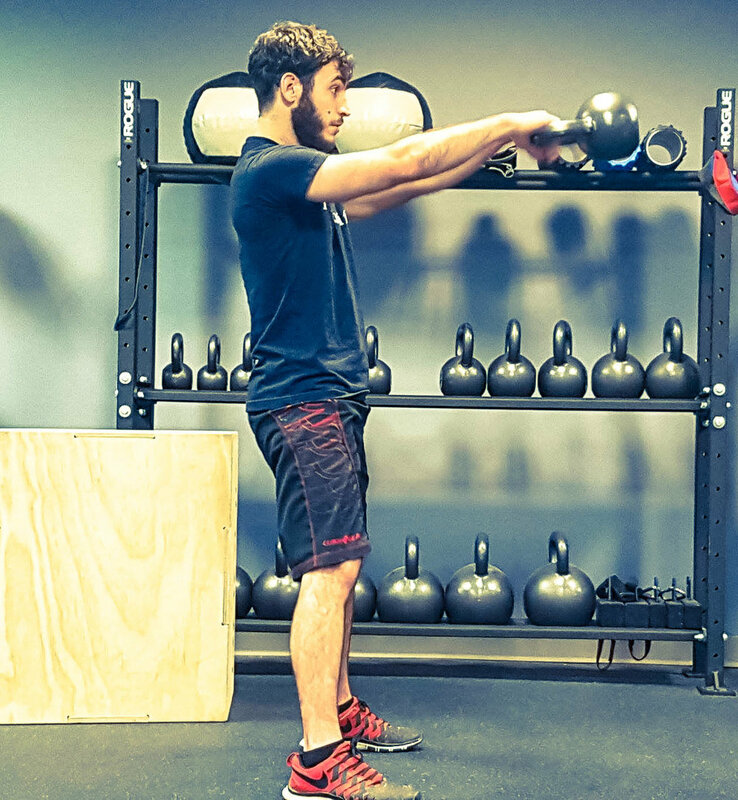 To start, place a kettle bell on the ground and step back a little more than one foot from the weight. Grab the weight with both hands and hike the weight in between your legs, hinging from the hip and keeping your back and maintaining a slight bend in the knee. Straighten your body, propelling the weight with your hips until the weight is eye level. Repeat, ensuring that you are moving the weight with a hip hinge rather than squatting or bending your back. The Alligator Walk is part mobility drill, part balance drill, and part body-weight strength exercise that forces yourself to work both sides of your body independently, says Tim Hufford, Strength and Conditioning Specialist at Chapel Hill Gracie Jiu-Jitsu. To perform the exercise, find a strip of flat floor that you can walk across. Get in a push up position and then lower the torso as close to the ground as possible. With alternating limbs, walk forward with your hands and legs while maintaining a low body level. You should feel like you are working your core throughout the drill. The deadlift is one of the most powerful postural exercises that recruits more than a dozen muscles, almost all of which are used when maintaining posture in guard. To begin the deadlift, place a weighted barbell on the ground and stand with the balls of your feet below the bar. Bend over and grip the bar firmly with both hands maintaining shoulder length distance. Lower your hips while maintaining a straight, neutral back. Remove the slack from the bar by pulling your shoulders back and engaging your lats. Lift the weight by extending your hips and knees. Return the weight to the ground and repeat. In Jiu-Jitsu, we often have to transfer our weight from one side of the body to the other when we are standing or passing guard. Lunges can be used to build balance and teach you to distribute weight in a safe manner. Being able to utilize our hips and knees when we shift weight is essential for maintaining that base, says Macri. To perform a lunge, take a step forward with one leg and dip your opposing knee to the ground until it almost touches the ground. Your back knee, hips, and shoulder should make one line from the floor to the ceiling. Make sure that you keep your back straight and engage your glutes as you stand up to a neutral position. Repeat. When we roll in Jiu-Jitsu, we often need to alternate between various intensities depending on whether we are in a good position or bad position. When we wish to be particularly aggressive, we must change pace to push the position. Our cardio should reflect this goal. While more of an exercise modality than a specific exercise, high intensity interval training will build your gas tank so you can push the pace for the duration of a roll. High intensity interval training can be described as periods of high intensity exercises followed by shortened intervals of rest, usually shorter than the duration of the exercise intervals. Interval training can help raise your maximum oxygen intake, increase the amount of blood that your heart pumps per beat, and makes the body more efficient at using energy, says Hufford. You can build your own circuit that uses a range of muscle groups to push your cardio, or you can join a group fitness class that will guide you through a circuit in a controlled environment. When designing a circuit, be careful not to use weights that are so heavy that you cannot perform multiple intervals. Consult with a fitness professional if you have any questions about program design.